Seeking and learning about what animals and birds do — just being themselves — has always drawn me out to the water's edge, the woods and to distant lands. There I gather small moments in the lives of wild creatures. Kathy Goff's unique approach to animal art is rooted in her New England birthplace. Living on the edge of a wildlife sanctuary, she raised a series of orphaned and injured creatures that served as subjects for her art. At the University of Hartford Art School, Goff majored in sculpture, incorporating animals into her figurative work. In 1970 she opened her studio in Colorado and traveled extensively, studying and painting wildlife in California and the Southwest, Europe, the Eastern Coastal regions and national exhibits and at galleries in New England and the Southwest. 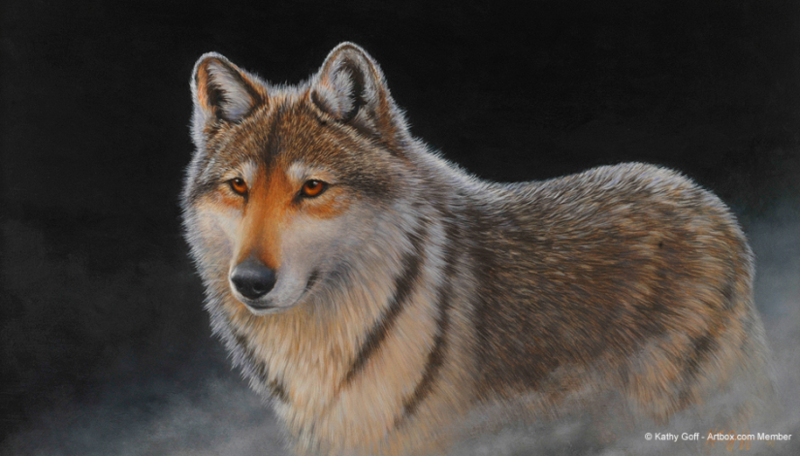 You will find Goff's artwork on greeting cards, for the National Wildlife Federation, Marian Heath, Leanin' Tree Cards and the American Humane Society. Her work has also been used extensively for fundraising by the National Audubon Society, Ducks Unlimited and other organizations. Recently, Kathy has been commissioned to paint some very special pet portraits that become cherished family heirlooms. Kathy's illustrated column can be found in each edition of Seasons magazine, in which she is a featured artist and author. Kathy Goff's unique and intriguing studio and gallery space is located at the Farmington Valley Arts Center in the center of Avon, Connecticut. The studio is a hub of activity for the artist who works in several media, both two- and three-dimensional. On any given day, Goff often has several projects in progress — magazine column illustrations on the drawing table, perhaps a pet portrait or wildlife painting on the easels, and a sculpture in clay on the work stand. Most afternoons, the studio also hosts several of Kathy's art students. She offers group lessons for home-schooled children and private lessons for teenagers and adults. Students and visitors enjoy the curiosity cabinets and shelves filled with nature objects and reference books. The studio is also Goff's gallery space with a rotating selection of paintings, drawings, sculptures and prints available for sale.